This pint-sized penthouse perched atop an elevator building at 368 West 23rd Street in West Chelsea manages to pack everything you need into two levels of renovated, sun-filled space and look good doing it. 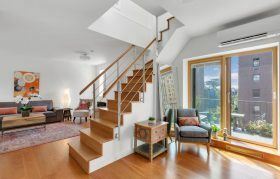 Asking $1.6 million, the one-bedroom co-op is freshly renovated with two full baths, new hardwood floors, central air conditioning, a wood-burning fireplace, and a washer/dryer. But it’s the impressive expanses of terrace that make the biggest impression.